So, you want to learn to speak Hebrew? Good choice! Not only can you have more fun in Jerusalem nightclubs and bargain at the market – you'll be able to read the Bible, too. What other language can promise you both? Hebrew is the language in which God created the world. It was spoken in the Garden of Eden and is spoken today in the gardens, homes, shops and cafes of Jerusalem. Although much credit is usually given to Eliezer Ben Yehuda for reviving the Hebrew language into a modern tongue, the truth is it had never disappeared. It was the language of prayer and study and the lingua franca of Jewish communities all over the word for millennia, through which scholars and merchants communicated internationally with each other. Once you learn to speak Hebrew, you realize it is much more useful than you might originally have thought. Not only will some basic knowledge of the language ease your way around Israel and allow you to eavesdrop on wacky conversations while riding Jerusalem buses, you'll start to notice that quite a few English words have Hebrew roots as well. OK, but how do you go about doing it? Isn't Hebrew hard? And written backwards? Don't worry! If all you want are basic travel phrases, we've got you covered. You really want to learn to speak Hebrew like an Israeli? We also go over what we think are the best resources and programs to help you achieve this worthy goal. Can you spot the spelling mistake in this photo? Hint: check the ancient Hebrew script chart here. Some academics consider the Hebrew language one of the hardest to learn, but in fact, millions of new immigrants to Israel, of all ages and from all over the world, have managed to learn to speak Hebrew fluently, so there isn't any reason you can't do the same if you set your mind to it. Once you decide to learn Hebrew, there are several different options. If you really want to learn to speak Hebrew well on your own time, and from home, nothing beats the conversational Hebrew skills you'll learn from online study with a real teacher. Small groups of students from around the world meet online with an experienced Israeli teacher. Not quite ready to make that kind of commitment yet? Then you might want to choose a first Hebrew primer and self-study course. These can teach you to read well and, if you choose an audio course, can give some rudimentary level of speaking ability. If these are too basic for you, the Rosetta Stone Hebrew Language Program is a computer program that can even grade your accent. To take your Hebrew to the next level, consider an ulpan, an immersion Hebrew language study course in Israel. Israel is famous for these types of courses where you get to learn the language in its homeland. What if you prefer the group learning experience of a classroom? Here's how to choose a class. The most traditional method of studying Hebrew is to find a class at a community center, synagogue or college near you. 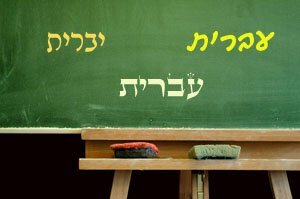 When you sign up, you should ask whether the primary goal of the class is for students to learn to speak Hebrew or to learn to read it. How you progress will depend as much on your teacher and materials as on your participation. On the other hand, this method has the advantage of getting you to meet other people who have a similar interest, and with whom you can practice speaking in Hebrew. Because the Hebrew alphabet is so different from what most people are used to – besides the fact that it goes from right to left! – many introductory courses are designed to either teach you to learn to speak Hebrew or to read it. In choosing the right course for you, it will help if you decide in advance which is most important to you at this point – reading, speaking or both? This way, you'll know what to look for when you're looking at your local options. Sign up for Mah Hadash, Jerusalem?, (that's Hebrew for "what's new?") and you'll not only get the latest tourism updates and special travel deals from Jerusalem Insider's Guide, you'll also get notified of special travel discounts and seasonal deals offered by eTeacher on its Modern and Biblical Hebrew courses. First of all, spice up your travel to Israel and learn to speak Hebrew by brushing up on some basic Hebrew phrases, move on to more common Hebrew phrases (for very important words like "yes" and "no"! ), and study Hebrew numbers. Do that, and you'll be well armed for a day of sightseeing and shopping in Jerusalem. Is it your child who wants to learn Hebrew? Check out these resources that teach Hebrew for kids. Click here for more information on where to get a free trial download of Babylon translation software, a program that provides great Hebrew translation online. If you're feeling a little mystical, here's an introduction to how Hebrew numerology works. If you'd like to study the Torah – or jot things down in secret code – have some fun practicing Rashi script, an ancient Hebrew script, primarily used for Biblical and Talmudic commentary. Those interested in Biblical Hebrew may also want to learn Aramaic. And – I saved the most exciting one for last – it really is possible to learn Hebrew free with an excellent home study program designed by the U.S. government for diplomats. You may also want to check out Learn Hebrew Phrases With Audio, a website that teaches Hebrew phrases through free audio and printable worksheets. May you have much success or, as we say in Hebrew, Behatzlakha! 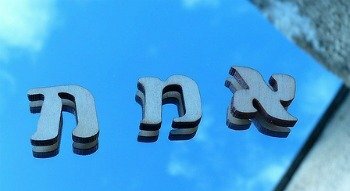 Photo credit: Hebrew word "emet" on mirror by zeevveez, under cc by 2.0 license.